In a small village in Poland in the early 1940s, two brothers deliver dinner from their mother to a neighbour. They are reticent to go because the neighbour has a reputation around town that is decidedly not good. He is illiterate and a vegetarian, which marks him as the village fool. But these are difficult times for Munio and his little brother Milek. Indeed, these times are very hard for everyone as they live under the spectre of war. When the tanks come, so do the Nazis. The Nazis do in Zborów what they had done everywhere else they had touched - they burned the Synagogue and rounded up the Jewish boys. Munio and Milek, as well as their parents and two neighbour girls are saved from the Nazis by the village fool and a night of cross-dressing. He and their father dig a tiny subterranean room using kitchen utensils, and manage to evade capture by not only the Nazis but also spying neighbours. After many months starving in a cramped underground room, the village is liberated and so are Anton's guests. Anton had gone from the village fool to the village hero! This book is a great introduction to the second world war and recent European history, as well as a heartwarming story of how standing up for your beliefs in the face of opposition is a heroic thing to do. Benoit's illustrations are great at bringing the reader into the time period and also for creating a feeling of empathy with the worried young people. The expressions on the faces of the young people who were trying so hard not to make a sound that they stuffed their mouths with rags are extremely moving. 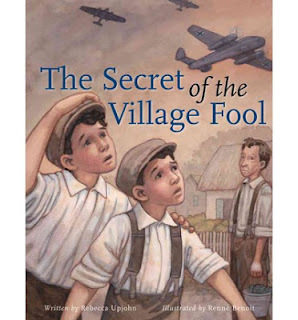 No mention is made of exactly what happens when boys are rounded up by the Nazis, although it is clear that Anton saves the children's lives, so this book is appropriate for younger history buffs as well as older ones who are aware of the horrors perpetrated by the Nazis. An afterword with pictures of Milek and Munio and their family with their hero, Anton, as well as the root cellar which had been their home add greatly to this amazing story of how one man can make a huge difference in people's lives. This review is a part of Nonfiction Monday, hosted this week by Hope is the Word Blog. This looks like a good nonfiction partner to a book like Number the Stars. Thank you for sharing and enjoy your trip! This sound really good and of course, right up my alley. I am always looking for appropriate books about WWII for younger readers. Thanks for this review. This sounds like a very good book, I'll put it on my wishlist, though I don't think I'll be reading it to Xander just yet(he's not quite 2yo).